A new edition to our Disney Christmas designs. So many people love to go to Disney during these cool, perfect weather months. 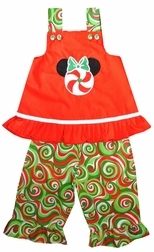 Our custom Disney Christmas Peppermint Minnie Mouse Dress or Outfit is just perfect to bring out the lovely red and green colors of Christmas. 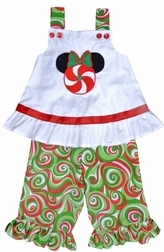 We start with a white dress or swing top and attached red and green Christmas swirls fabric shoulder straps that fasten with red buttons. 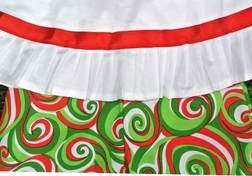 The bottom of the dress/top is embellished with a pretty white ruffle and red ribbon just above the ruffle. 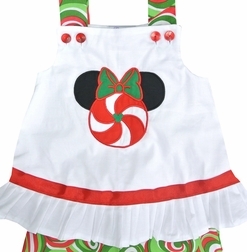 Minnie Mouse in the form of a Christmas peppermint candy with a big green candy bow is appliqued on the front. Precious! The trousers if chosen are made of the swirls fabric.